So - what am I up to? You can see some past projects on my website, so I'll document what I'm working on now. A public art project on the Scarborough - Whitby Old Railway Line is my most recent project. Commissioned by Scarborough Borough Council and the Friends of the Old Railway Line this is a joint project with Adrian Riley of Electric Angel Design. The finished artwork will be ground based and will act as both signage and waymarker. Visually the artwork is inpsired by period railway typography with giant lettering and subtle glass inserts within paving made from recycled glass. Poetry by John Wedgewood Clarke is being etched into the surface. We went to the site with John and talked to users of the track in order to generate words and phrases that formed the raw material from which John has written the poem. 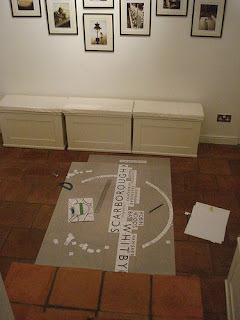 Progress can be seen on the projects own blog http://www.railwayart.com/ This images shows the scale mock-up in progress. The project has been a complicated one particularly regarding costings and sourcing materials and services and has taken many hours of sorting! It's been a steep learning curve but fun nevertheless. It's also been great working with Electric Angel. It has made me realise I much prefer working with other people. Partnership working here I come! I started out as a painter and printmaker, gradually gravitating towards glass through a lifetime fascination with all things transparent, translucent and reflective. After some time earning a living through curating, arts management and gallery based education I took the plunge and did a Masters Degree in Glass at the University of Sunderland (and got a distinction - hurrah!). This intense period of study expanded my repertoire of techniques and skills base as well as developing my work from an intellectual and critical perspective. It was an amazing experience and I squeezed every little bit out of it that I could. I became really good at juggling plates (or I had plenty of practice at any rate) - combining paid work, looking after a 5 year old and part-time but all consuming study was bloody hard work and nearly killed me! It was a really good decision to go back into education though, as already it has fast-tracked my art creating career immensely and things look poised for action! Art, Life and Architectural Glass is a documentation of my work as an artist specialising in architectural glass. It aims to show an up to date record of what I'm up to - projects I'm working on, things I'm thinking about, what I'm actually creating and how those things came about as well as interesting stuff I see, find, read, listen to or experience. It is intended to give some sort of background view of myself as an artist, showing the person and processes behind the artwork.